Have you dreamed of having a classic cooking space customized to your needs and style? Everyone’s tastes are different and many settle for the standard kitchen that comes with their home. However, there are so many options available to turn your cookie cutter kitchen into a work of art, designed just the way you want. 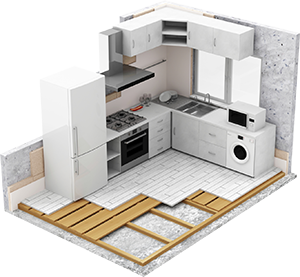 From cabinets to countertops to tile, and everything in between, Mario’s True Value Home Center has the tools you need to successfully navigate a kitchen remodel. Visit our beautiful showroom and speak with one of our expert kitchen designers to turn your dream kitchen into a reality. Our experienced and trained professionals can guide you every step of the way and help you create the look you have been waiting for. We carry a full line of kitchen products—including fine cabinetry by Starmark, Mid Continent, and Young Furniture—and have a team of professionals ready to help you cook up your dream kitchen in no time. 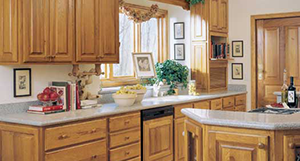 Mid Continent Cabinetry has a large selection of glazed, painted, and natural wood cabinets, perfect for any kitchen. The ideal kitchen is different for everyone. At Mario’s we can help you create the kitchen that meets your unique needs. All our kitchen cabinets have plenty of options, such as custom glass and grille choices, a drawer option, and different wood species. 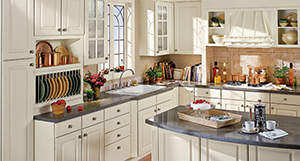 Starmark Cabinetry is personalized for the homeowner’s lifestyle. Using products designed by trained professionals, you can use the depth of the Starmark line to achieve a value investment for your home, delivered complete and on-time, every time. Starmark Cabinetry uses only quality hardwoods to build doors, cabinet boxes, drawers, and roll trays. We do not use particleboard for these components.